Why Not, Minot?... I'll Tell You Why Not! 5. Denim Disasters: Being from Dothan, Alabama, many people would probably assume that I've seen my fair share of denim (thank you, National Peanut Festival). WRONG! Apparently, I missed the denim memo that was sent out to fair-goers, because 90% of the people attending chose to wear denim in some form or fashion -- jorts, jean skirts, jean skorts, denim shirts, etc. -- EVERY DAY of the state fair. Check out a couple pics of my favorite denim disasters. 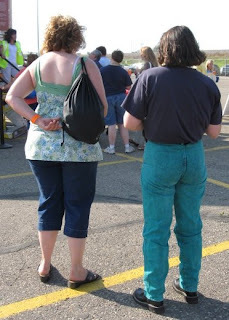 Please keep in mind, at some point in the day, these people decided "this looks good enough for me to wear in public": Emphasis on the Electric Turquoise Denim Pants! And NO, I did not fork over money for this State Fair Delicacy! Well, these are the highlights from the North Dakota State Fair "Ev-enture". Check back in soon for more "Ev-entures" from the Wisconsin State Fair! Until then, I'll be on the road! Hahaha ... a text messaging competition? Perfect. I think you hit all my favorite suggestions. One question. 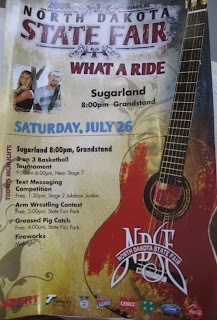 What in the hell is Sugarland doing playing the ND State Fair? Did they go on after Tiffany? Jennifer must have thrown more than a few F bomb's when arriving in Minot. Sheesh. Wonder how the roller ball trick worked there. Was it like 10 ft. long? Looking forward to the next Eventure. I want farm animals! Question. Can I use T9 when I compete in the text messaging competition? EH-BINS...you look good in 18-wheeler! I made my way over through google reader's recommendations . . . and I'd have to say that the NoDak probably prepared you well for the experience that is the MN State Fair.